*We specify 2 months shelf life, nonetheless, we have used substrates, which were produced 6 to 12 months prior to use and have not noticed any significant degradation. The active SERS area is formed using an ultra-short pulse laser on a soda-lime glass substrate. The substrate material is a weak Raman scattered and therefore particularly suitable for SERS (as compared to most crystalline materials). The resulting surface structure features stochastic nanopattern, which meets good resonance characteristics for various excitation wavelengths and adsorbed analyte molecules. A single SERS substrate can be used for various experimental conditions, analytes and results in a very high relative enhancement ratio of the Raman scattering up to 106. Silver-plated SERS works well not only in the IR range of excitation wavelengths, but also in a visible (blue, green) range as well. Convenient size of the overall substrate (25 x 25 x 1 mm) is approximately a third part of a regular microscope slide, therefore it fits nicely into universal multi-wavelength Raman microscopes and can be used with dedicated compact SERS readers or spectrometers as well. 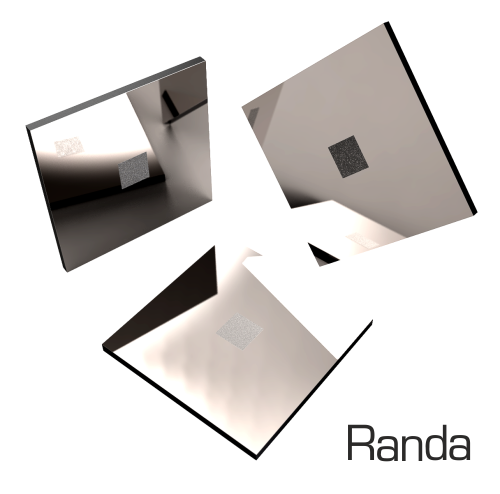 Active area of the standard 'Randa' SERS substrate is 4 x 4 millimetres by default. Flexible manufacturing technique allows to change (increase or decrease) the size of the SERS area on request. Active areas as large as 10 x 10 mm have been produced specifically for application of electrodes (electro-chemical experiments). All 'Randa' Raman substrates are vacuum packed in a cleanroom environment. No glue or other chemical substances are used during manufacturing, i.e. for attachment of active area chips to submounts (which is a common feature of counterpart products).